Not good, it's fantastic! TPG fibre 400 is one of the fastest business grade internet services currently available in Australia. Comparable to the NBN, TPG Fibre 400 is significantly faster, and in fact 4 times quicker than any other NBN Service Provider can offer. Small to medium businesses can now obtain high speed Internet via TPG’s 400 Mbps offering, this means you can download and upload simultaneously via your TPG link at 400 Mbps. 10 years ago, many small business, large business and even government agencies have only ever dreamt about 400-megabit upload and download per second connections. Now you can obtain Australia’s fastest and probably most reliable Internet connection with TPG's 99.95% availability SLA (service level agreement). TPG Fibre 400 plans are on 24-month and 36-month terms. What can I use the TPG Fibre 400 for? You can use a Fibre 400 link either as a dedicated Internet service, which means it’s dedicated for surfing the Internet, or you can choose to connect up to 4 different service types which would share the bandwidth and utilise the same pipe. An example for sharing your pipes bandwidth, you may wish to dedicate 100Mbps as an internet connection and you might like to allocate 100Mbps to VPN’s whilst assigning 200Mbps for connecting direct to Amazon Web Services. If your business is heavily reliant on the Internet as most businesses are these days, it would definitely be worth a look into TPG’s offerings. TPG utilises their Metro Fibre Network to be able to deliver unmatched high speed dedicated links. TPG will refer to the Fibre 400 service as MetroE access type, which basically means Metro Ethernet or Ethernet delivered in Metropolitan areas. Yes, TPG does have a competitor fast on its tail, in fact, this particular competitor is offering 500 Mbps instead of TPG’s offering of 400 Mbps. TPG’s competitor is Vocus. If you haven’t recently heard in the news, Vocus have just purchased Nextgen Networks in 2016 for a whopping 700 million dollars. By Vocus purchasing Nextgen Networks it increases fibre footprint throughout all of Australia expanding it's existing footprint of 6800 kilometres to 17000 kilometres. Between the major carriers such as Telstra, Optus, TPG and Vocus, combined they supply more than 90% of broadband services to Australian people. As Service Providers compete for your business, 400 or 500 megabit per second connections will only become cheaper over time. Moving into 2019 - 2025 also expect faster speeds increasing to 1Gbps, 10Gbps and 100Gbps for backhaul. Oh sorry I forgot to mention, the TPG 400 Fibre link is priced at $399 plus GST and the Vocus 500 link which is otherwise known as Internet Express is sold from $499 per month, however it doesn’t mention whether include GST. Both TPG and Vocus are offering an all you can eat, or as most like to call it these days unlimited data on these connections, which means you can download to your heart’s content. Yep, everyone’s dream. Is TPG fibre 400 more reliable than traditional business grade services? Yes, when you compare TPG fibre delivered services to the standard copper traditional ADSL, SHDSL or similar business grade Internet services delivered by copper, you can be sure that TPG will provide a higher level SLA than any other delivery method with a strong likelihood of actually sticking to it. 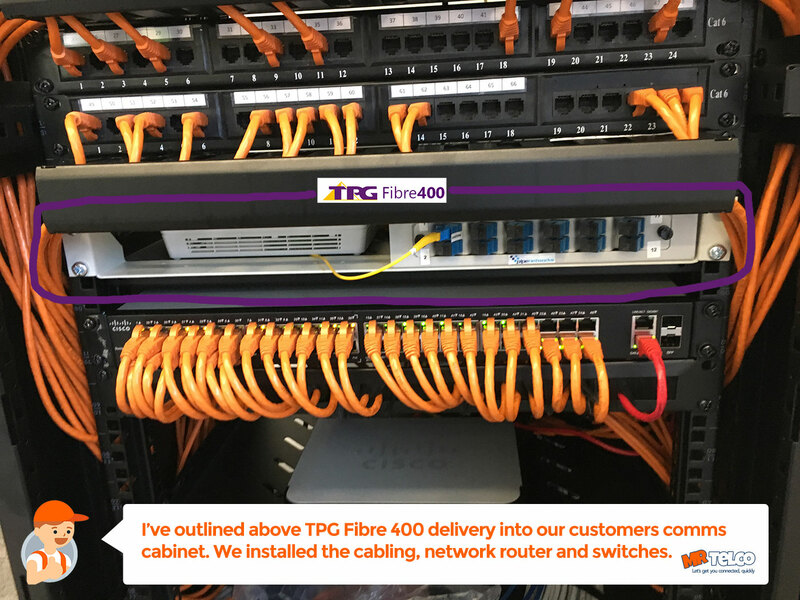 The beauty of TPG Fibre 400 service is that it actually delivers a fibre optic cable all the way from TPG’s upstream node directly to the customer’s premises. The customer’s fibre optic cable will be terminated inside the communications cabinet within the business, of which it will then hand off on to one of TPG’s network termination units or otherwise known as an NTU. This particular ONT is provided from Huawei and is called the Huawei HG8240H. The Huawei HG8240H ONT comes with 4 Gigabit capable customer handoff ports, ready for you to plug into your network firewall router. What Firewall Router is best to use on TPG Fibre 400? Should you be considering TPG Fibre 400 for your business, it is recommended that you check your existing firewall router for being capable of handling such high throughput, and of course having enough CPU power for your application. Sending high amounts of traffic over through your internal network means, you’ll need to ensure your firewall router has minimum 1Gbps ports, generally you’ll want to look for a firewall router that says, it handles 10/100/1000 Mbps Gigabit Ethernet WAN + LAN ports. The router must be able to perform backplane switching of at least 400Mbps between LAN and WAN ports. Mr Telco recently performed a network installation for our Sydney customer on the Fibre 400 plan, and we installed a CISCO RV220W Network Security Firewall in the customer’s network. Depending on your situation, you may wish to take TPG’s managed router firewall solution or simply use your own. If you require any assistance with that, contact Mr Telco’s Network Team for more information. 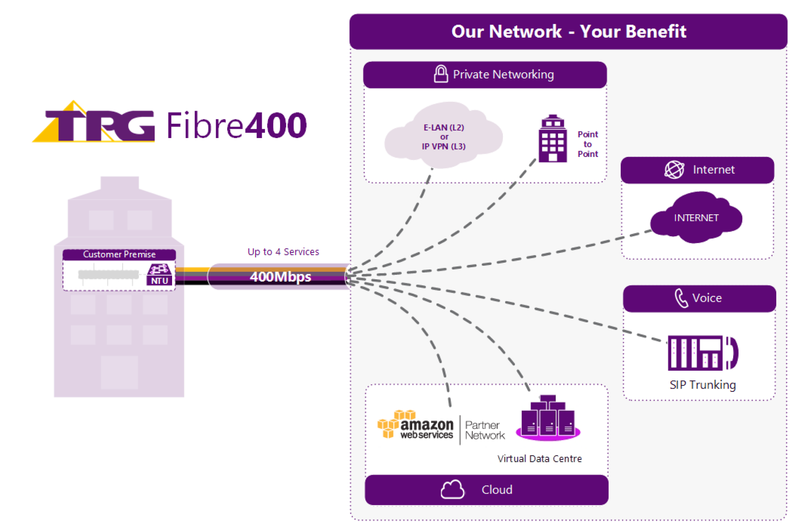 Installing TPG’s Fibre 400 connection depends on availability of whether TPG can service you via their on-net fibre footprint. If for some reason you’re not located on TPG’s metro fibre footprint, they can also offer alternate services using off-net service providers and connectivity methods, however you will be expecting to pay more than TPG’s quoted $399 + GST per month. Moving across to Fibre 400 links means you’re going to require an internal review of your existing network infrastructure to enable your maximisation of speed, up-time and security. If you are looking to move forward, our team of dedicated Engineers can perform an internal review or audit on your existing network. Mr Telco will perform an overall audit of your wireless network distribution, switches, routers, cabling and provide you a written, detailed and actionable report, so when you are ready to cutover to TPG’s Fibre 400 link is a successful and seamless experience. Should TPG’s Fibre 400 link sound like something for you, contact our technical sales department for further assistance and instruction. 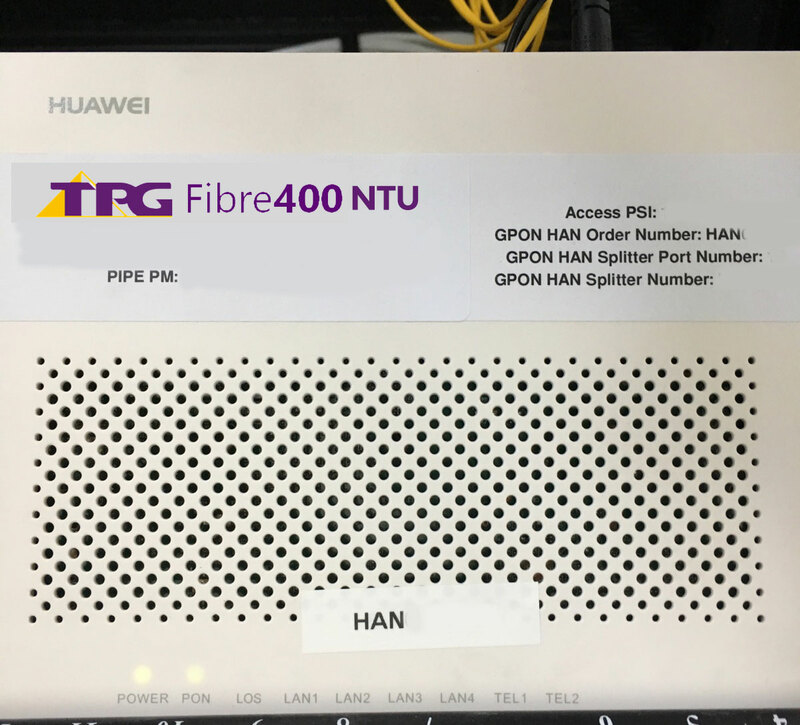 Need help setting up your TPG Fibre 400 connection or network?